I knocked off this little skirt from the minimal remnants of the grey ponte that I used for last week's pants. The most remarkable thing about it, really, is that it's one of the patterns from this very month's Burda Style Magazine. Such up-to-the-minute creation is rare in these parts. The pattern has two versions - a micro-mini skirt and a more modest knee length view with a self-fabric tie belt. Mine is somewhere between due to fabric shortage. The need for ingenious cutting out of about 65cm of fabric meant that the high waist had to be lowered and the hem is all but non-existent. But 10cm above the waist would have been too high anyway (my waistband is 5cm). As for the hem, I'm seeing how long 1/2" steam-a-seam, without stitching, will last. The pattern is designed for woven fabrics. I should have cut a size smaller. I did a lot of in-progress fitting to get the waist and hip curve right. Other than that, the only change I made was to turn the separate pockets into a single kangaroo pocket, which you can see from this inside-out shot. I used a remnant of woven cotton to reduce bulk (and because I had no extra fabric). I used the same cotton (interfaced) for the waistband facing. There's an extremely elegant knitter on Ravelry who has the most lovely white hair and knits a lot in grey. It looks fabulous. For many years, I never even considered wearing that "colour" (if it really is one). But recently I've taken to it. 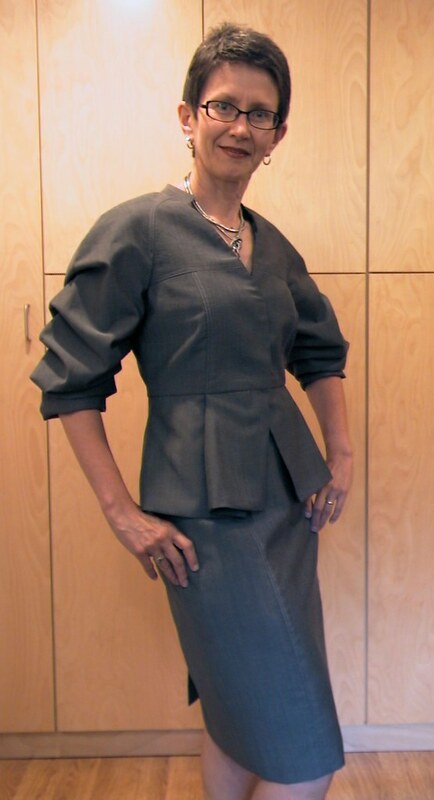 I have made two grey suits - the Akris knock off from the summer of 2011 and my most recent tailored creation. I'm enjoying both of them quite a lot. And now The Sewing Lawyer has made another pair of comfy but hopefully not unattractive stretch pants in ... grey. They are the same as the black ones. 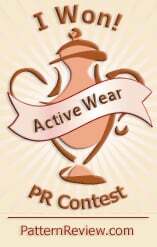 Which I wear all the time. So far I have had them on three days in a row, including for two very serious meals. They remained very comfortable throughout. And, in knitting news, I'm working on a grey top! It's the Windswept Pullover. I will keep knitting until my yarn runs out. I only have 300g of my yarn, which is 70% baby Llama and 30% Italian mulberry silk. (Yum!) I'm going to block it so the lace panels along the neck line lie straight. Stay tuned to find out if it will have short or 3/4 length sleeves. Ravelry notes are here. After posting yesterday, I gave myself a talking-to and just finished those baby hems. It didn't take very long. Of course. It tamed the shifty static-prone and flimsy silk like nobody's business. It made making this top (complete with French seams, continuous lap placket, bias collar and baby hems) a piece of cake. I managed to find perfect buttons in stash. They are a bit like gold nuggets. Closed with teensy bias loops, which would actually have been impossible to sew without my friend spray starch. And the entire ensemble. Don't ask me why my camera refused to focus for this one. And the weather may finally be warming up. For once, The Sewing Lawyer's latest project is going to be seasonally appropriate! Working for a living has its good and bad features. On the plus side it provides an income with which to purchase fabric, patterns etc. And it gives The Sewing Lawyer a venue in which her custom-made suits, dresses and other items of clothing can be worn. The negative of course is that working full time means The Sewing Lawyer has less time for sewing and knitting and ... blogging. 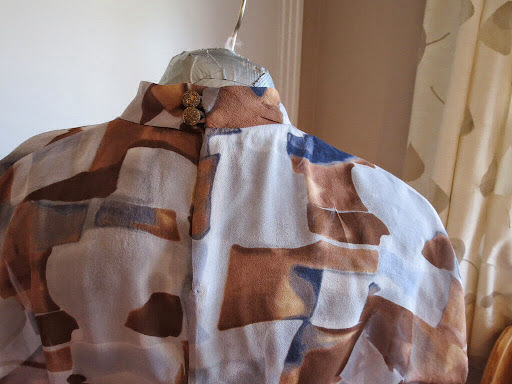 Even though the skirt to match the latest jacket creation was in fact complete before work resumed (3 weeks ago) and this blog post planned well enough that all the in-progress photos were taken, life intervened and you all had to wait. I'm sorry about that. The skirt is really profoundly uninteresting as a fashion object. It's made from the same OOP Vogue pattern as the skirt in this post. Except I did not shape the waistband so it's even plainer. However it makes a good foil for the jacket and someday, I promise pictures of the entire ensemble along with the silk blouse to match that is stalled and waiting only for its baby hems. In the meantime I offer a photo tutorial on mitering corners. 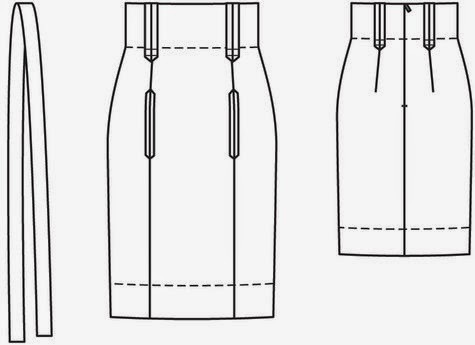 It's my preferred method for a super-neat finish on a skirt with a back slit, but it can be used any time you have to sew a corner where two folded or faced edges, such as the slit facing and the skirt hem, meet. No pattern fudging required; you do it on the fly. Start by pressing the facings that are going to be mitered. At right is the inside of my skirt hem at the CB. I've made sure the corners are exactly in line. Next, mark on each fold separately the point where the inside edges of the two facings intersect. In the photo at left, I've done this with pins. Unfold the edges, and refold with right sides together so that the pins meet. As you can see in the photo to the right, the pressed corner is exactly on the fold line. That is where you want it to be. The line between the pins and the pressed corner is your stitching line. Mark it. Sew along the line. Do the other side of the slit. Then turn the corners right side out and press. I find that I do not need to trim away the parts of the facings that are inside the mitered corner, unless the fabric is very bulky. On this skirt, they fit in there very neatly and give weight to that part of the hem.